The freewheeling presentation of these paintings, unframed drawings on found paper, mixed-media sculptures, and more lends Sullivan’s show the in-process feel of a studio visit. 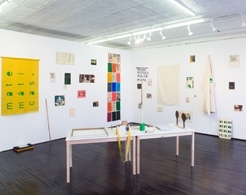 In collage-like abstractions, designs of chartreuse, coral, and blue alternate with red pinstripes, absurdist snippets of text, and elaborate black and green curlicues. On a table in the middle of the room, a dozen or so sheets of pastel-colored dough have been impressed with patterns of circles and lines. The high point seems to hint at Sullivan’s base, in the Hudson Valley: a pair of gritty yet bucolic still-lifes, painted on four-foot-square boards, covered in washes of translucent forest green punctuated by little orange suns.